Remember gaming night? You and a bunch of friends would gather around a table at someone's place and before long, a favorite pastime would emerge from a cabinet or a closet and everyone would be playing. Maybe it was classic boardgames or pen-and-paper RPGs. Perhaps you were the wargame type or preferred to take your chances with a deck of collectable cards. Good times don't last forever, though. Friends move away, jobs change and groups can find themselves split on opposite coasts. Fortunately, that doesn't have to spell the end of play time anymore. The Battlegrounds suite of software (various pricing, free demo) allows players and GMs alike to collaborate in a virtual, whiteboard-like space especially designed for gaming. The Battlegrounds dice-rolling module supports standard modifiers as well as dice pools systems, open ended rolls, criticals and more. The suite is split into two packages, the Battlegrounds Gaming Engine (BGE) and Battlegrounds: RPG (BRPG). The former specializes in board games, card games, and wargames, whereas the latter handles the more complex task of managing a D&D style role playing session. Most of the action takes place on a shared virtual game-mat or scanned game board, where the players move digital representations of tokens or characters around using point and click or keyboard commands. Battlegrounds' exhaustive set of tools allow the GM and players minute control over the gaming experience. In addition to the expected dice rolling and mapping functions, advanced organizational mechanics like the turn sequencer and the card deck manager allow fairly esoteric systems to be accurately translated, although there are diminishing returns past a certain level of complexity. Quick reference functions allow scanned and PDF game documents such as spell lists and character sheets to remain at everyone's fingertips during play. The Battlegrounds site offers artpacks for both free download and purchase, and the suite was designed to work from the group up with assets created with Dundjinni. Audio/visual triggers allow the use of background music, sound effects, video and stills to be shared at the click of a button, a tremendously useful feature difficult to effectively duplicate without interrupting the flow of play. In fact, there are so many layers to the package that it's easy to go overboard and find yourself spending far more time prepping for games than actually playing them. For software produced by a single man, Battlegrounds' results are impressive. Careful consideration has been given to the details of a group-centered experience. For example, you can distribute your game's assets to players with a single, closed-format file that will prevent prying eyes from peeking ahead. The purchasing scheme is similarly thoughtful. You can buy traditional standalone licenses, but floating keys exist for game hosts with fluid groups so anyone can join in as long as a slot is open. Simply use the free demo; it will recognize the open playing slot and act as the full player client as long as it remains connected. Another example is the automatic sync function: tokens, tiles and other images up to 2 megabytes are automatically transferred to other players with no user intervention required. Problems are mostly of the background-noise variety. I experienced a few error dialogs when restarting Battlegrounds after changing screen resolutions, and bumped into a few sync errors during testing, but nothing serious enough to question stability. The many contextual menus can take a little bit of familiarity to use, but the minimalist approach to UI means you see the game and the presentation, rather than the software framing it, which is a boon to the immersive atmosphere both BGE and BRPG strive so hard to maintain. The price is a little high, but not enough to give pause. There aren't many packages out there that can pull all of this off, and fewer still have such specific support for board games which broadens the appeal considerably. You also get an actual, dedicated developer on the other side who will listen to your requests and who takes his gaming seriously. That alone is worth the cost for some. 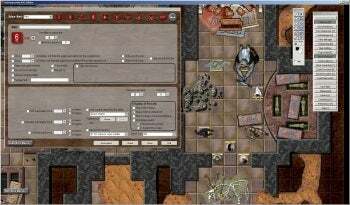 If you're an old-school tabletop gamer using Skype and email attachments to keep your group alive, you owe it to yourself and your friends to take a tour of the Battlegrounds and see what you've been missing. Note: The BGE gamer client is available in various packages, from $15 for one player to $40 for fifteen players. Gather your old gaming group around the virtual Battleground game table.